University of Cincinnati Senior Vice President for Academic Affairs and Provost Kristi A. Nelson, has appointed Nicolas (Nick) Williams as interim dean of the Carl H. Lindner College of Business, effective June 1, 2018, as David Szymanski transitions to the University of North Florida where he will serve as president. Williams currently serves as the associate dean of graduate programs at Lindner. "I have every confidence that Nick will serve the Carl H. Lindner College of Business with distinction, while working closely with the associate deans, department heads and faculty to advance the work of the college," says Nelson. Nick will be an integral member of our leadership team as we collectively work to advance the universitys strategic direction."
In February, UC President Neville G. Pinto launched Next Lives Here,  a strategic direction to propel the university over the next 10 years. Next Lives Here, a future-leaning vision of "Leading Urban Public Universities into a New Era of Innovation and Impact," focuses on three platforms: academic excellence, urban impact and innovation agenda. "I am honored to serve the Carl H. Lindner College of Business as interim dean," Williams says. "I have a deep connection to the University of Cincinnati and look forward to collaborating with faculty and staff to continue the upward trajectory of our college. Additionally, I look forward to working with President Pinto, Provost Nelson and the other deans here at UC as we enact Next Lives Here."
Williams joined the UC faculty in 1990 as an assistant professor and was promoted to associate professor in 1997. He served two separate terms as academic director for the master of science in applied economics program from 2001-2004 and from 2008-2013. He served as department head of economics from 2013-2016 and was named associate dean for graduate programs in 2016. Throughout his 28-year career, Williams has taught classes ranging from Principles of Economics to MBA Managerial Economics to Advanced Econometrics. Additionally, he served as a visiting scholar at the University of Leicester and Yale University. His research interests are in labor economics and econometrics. He has focused on econometrically investigating job mobility and wage determination as well as the employment effects of the minimum wage. Some of his published papers have appeared in the Review of Economics and Statistics, Industrial and Labor Relations Review, Labour Economics and Applied Economics, among others. 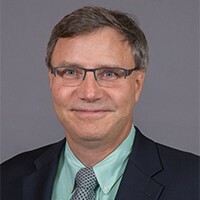 Williams received his undergraduate degree in economics from the University of Michigan and his master's and PhD in economics from Northwestern University. In his new role as interim dean, Williams will utilize his strong ties to the university and city of Cincinnati communities to help propel the colleges path to continued preeminence. As a leader in research and teaching excellence, the Carl H. Lindner College of Business has earned national acclaim in several academic areas across its undergraduate, graduate and online programs. In 2019, the college will move into a new state-of-the-art building, which will serve as a 21st-century hub for students, faculty and the Greater Cincinnati business community and provide a collaborative space for education, research and innovation to thrive. The 225,000-square-foot facility is one of the most ambitious construction projects ever undertaken by the university and promises to firmly position Lindner among the best business schools in the nation. A full search for the next dean of the Carl H. Lindner College of Business will begin in Fall 2018.